Last Wednesday night, I was at an Episcopal church for the installation of the new rector. I sat in a pew with the rest of the clergy, and at one point during the service, the priest next to me reached over and pulled out a card that had been filled out by someone and returned to the pew holder. It was a newcomer’s card – you know, the kind where the parish welcomes you and asks you to share some information about yourself. These cards are supposed to go into the offering plate, but this person put it back in the holder. Because the writer didn’t actually offer the usual information. The Doubt of St. Thomas, by He Qi. “Can anyone tell me if Jesus is real? (it read). “Can anyone prove to me that Jesus is real? “I’m sitting here surrounded by people who believe, people who have faith … and I don’t know if I can believe. This plea was written on Sunday morning, on the first day of the week – on Easter morning. There this person sat, in the third pew on the Gospel side, surrounded by hundreds of other people shouting, “The Lord is risen indeed! Alleluia!”, not knowing how to believe! I do not know if this person was male or female, black or white or Latino or Asian, young or old, gay or straight. We call today “Doubting Thomas” Sunday. Poor Thomas. Just because he wasn’t in the upper room when the Risen Lord first appeared to the disciples, we mock Thomas for wondering what was going on, and we hang an epithet on him – “Doubting” – as though nothing else he had ever done – none of the faithful following of Jesus, none of the declarations of “let’s go also, that we may die with him” – ever happened or even matter. Nowhere in John’s presentation of the Risen Lord’s appearances in the upper room does the word “doubt” appear. 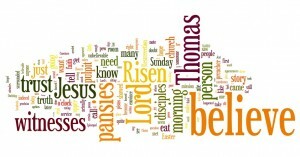 What Jesus says, instead, is that Thomas is apistos – without trust or faith. He was just like those other disciples, who had been apistos as well. They were untrusting just like Thomas (remember, when Mary Magdalene came to them that very morning with the news of the Resurrection, they for darned certain didn’t trust or believe her, because if they had, they wouldn’t have still been huddled behind locked doors in that upper room, praying no one would find them!). They had not been pistos – faith-filled – until the moment the Risen Lord had bid them his peace and showed them his wounds. So you see, it’s not that Thomas doubted. It’s that he wasn’t quite ready to trust again – not this soon. Well, then, Jesus was arrested, tortured, killed. And all those words, all those miracles, all that hope, that love, that joy … all of that had died on the cross and been laid in the tomb, and now … now … just three days later, the other disciples want Thomas, who has given up all hope, to hope again? They want Thomas, who saw his trust violated, to trust again? Just three days later? You know what Thomas was thinking, right? Thomas needed more than just the word of the other disciples – because he had believed once and been burned, and he wasn’t going to get burned again, at least not that easily. It took another appearance by the Risen Lord to convince him. Sounds just like that person who showed up at that church on Easter Sunday, doesn’t it? Can anyone prove to me that Jesus is real? Thomas two thousand years ago … an anonymous person on Easter Sunday 2011 … they’re asking the same questions, they’re caught in the same bind. How many witnesses do you need to believe the truth? How many witnesses do you need? Let’s do a little experiment in faith, shall we? Let’s see what happens when together, we do something rather unbelievable, and you have to convince others – let’s say, the people at the 8 a.m. service, because I wasn’t here for that – that what is about to take place actually took place here this morning. 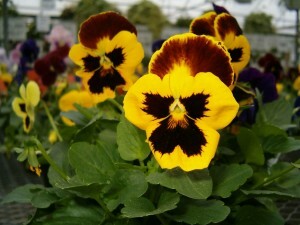 They are pansies – I know this because I went to a nursery yesterday and specifically asked for them. They’re pretty, are they not? They’re lovely harbingers of spring. They come in an assortment of colors, which I have carefully chosen, because believe me, colors make a difference. Mmm … quite tasty, actually. And yes, just to let you know, it is perfectly safe to eat pansies. 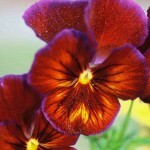 Not so much other flowers, but pansies are fine. Now … if one of you were to call someone who came to church at 8 o’clock this morning and tell that person, “You’re not gonna believe it! The preacher ate pansies in the pulpit!” that person probably would not believe you. Because unless I’m sorely mistaken, preachers do not normally eat pansies in the pulpit. It simply isn’t done. Now … if, say, ten of you were to call that same person who came to church at 8 o’clock this morning and tell that person, ““You’re not gonna believe it! The preacher ate pansies in the pulpit!” there’s a good chance that person still won’t believe you. Because, after all, ten of you could be pulling off an elaborate joke, right? But what do you think would happen if all of you were to call that person who came to church at 8 o’clock this morning and proclaim, “The preacher ate pansies in the pulpit!”? Do you think they would believe? Because all of you were witnesses, and all of you proclaimed the truth? My friends, I assure you: If enough of you testify to the truth, others will believe. And the truth is, this morning, I am eating pansies in the pulpit. So again, the question: How many witnesses do you need to believe the truth? Going back to the Scriptures and the Resurrection of our Lord and Savior Jesus Christ, how many witnesses do you need to believe the truth of the Lord’s Resurrection? Because we have witnesses. We have lots of witnesses. 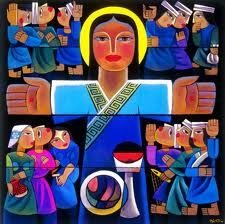 We have the women who went to the tomb on the first day of the week and met the Risen Lord. We have the disciples, hiding in fear in the upper room. We have Thomas, who eventually did trust enough to believe. Exactly how many witnesses does it take to convince you that the unbelievable is believable? What does it take to make us move from Thomas’ “I do not trust your story and therefore will not believe” to Thomas’ proclamation, “My Lord and My God!”? Do I need to eat more pansies to make the unbelievable believable? Because I will, if that’s what you need. Just as the Risen Lord made many more appearances to his disciples, which John did not write in his book, because that’s what those disciples needed. To have their trust restored, to be able to believe again, to become pistos again, Jesus came back, again and again, so that his disciples could know, beyond the shadow of any doubt, that he was raised from the dead. My friends, we are not the witnesses to the actual Resurrection. But there were witnesses – lots of witnesses, hundreds of witnesses – who saw the Risen Lord, and because of that they became pistos – they trusted again, they believed again. And because they trusted and believed, we trust, we believe. That’s why we’re here this morning – because we trust and believe their eyewitness accounts, the ones they have been passed on to us. So what are we going to do with this trust, this faith that we have received? How are we going to tell the story in such a way that those who do not yet believe – like that anonymous person who wrote that poignant note last Sunday – can indeed learn to believe? How are we going to proclaim the Good News of God in Christ Jesus? We don’t get to hear the story of the Resurrection just so that we can put that story in our back pockets. We hear the story, we become pistos, so that the whole world can hear the story, so that all can become pistos. It’s kind of like me eating these pansies in the pulpit. It’s a good story, but it doesn’t mean much if you don’t do something with it. So here’s what I want you to do. I want you to go home and pick up the phone and call someone from the 8 o’clock service (let’s call him “John”) and I want you tell him that the preacher ate pansies in the pulpit. I want you to convince him that this really happened. And then, I want you to talk a little Gospel. Talk about where you have seen the Risen Lord in your life, today, and everyday. Convince him that the Lord is risen indeed. And talk about where he sees the Risen Lord in his own life. I guarantee you, there are more Thomases out there. Thomas might even sitting right here this morning. Any one of us could be Thomas. Whoever Thomas is, wherever Thomas is, he needs to hear from us. He needs to hear that the Lord is risen indeed. Our mission is to tell the story in such a way that those who are apistos can become pistos, those who aren’t sure, who don’t trust, who want to believe but can’t quite get there, become certain, dare to trust and do believe. 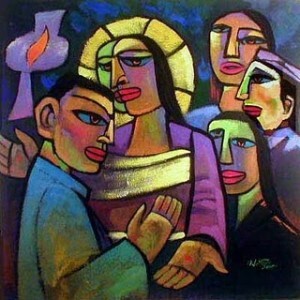 Sermon preached on the Second Sunday of Easter, 1 May 2011, Year A, at Holy Cross Episcopal Church, Dunn Loring, Va. 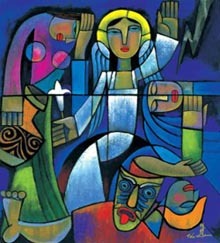 This discussion is based on Brian P. Stoffregen’s Exegetical Notes on Crossroads Christian Resources, http://www.crossmarks.com/brian/john20x19e2.htm, accessed 26 April 2011. Stoffregen’s translation, along with The new Greek-English InterLinear New Testament, United Bible Societies’ Fourth, Corrected Edition, 404. A couple of weeks ago, a friend of mine asked on Facebook what we would say if we had to Tweet the Good News of God in Christ Jesus on Easter morning. You all know what Twitter is, right? It’s that instant messaging service in which you can say whatever you want in 140 characters or less, including spaces and punctuation. I have to be honest: I have not been a fan of Twitter. I find it to be terribly narcissistic, that most of what goes out to the world is useless, vainglorious nattering. But Twitter now has a place in our lives. Look at the role it has played in the Arab Spring … in Tunisia, Egypt, Morocco, Yemen, Bahrain, Lebanon and Syria. More than 26 million Americans alone use Twitter … tens of millions more people use it around the world, and tens and tens of millions more people follow it without every posting a thing. Which means that if we can come up with a really, really, really great Tweet on Easter, we could reach tens of millions. And if our Tweet is really, really, really, really great, we can reach maybe even hundreds of millions of people! All we have to do is figure out what to say about the Risen Lord in 140 characters or less … including spaces and punctuation. How should we announce the greatness of this day? 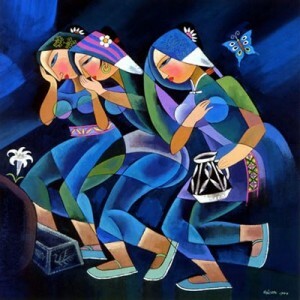 The Women arriving at the Tomb, by He Qi. Perhaps we could turn to the Psalmist: “The right hand of the Lord has triumphed! The right hand of the Lord is exalted! This is the Lord’s doing, and it is marvelous in our eyes.”? (That’s 139 characters.) But … that’s not quite clear, is it? And it is very triumphalist. So this won’t work either. Um … I’m thinking this isn’t the good news we were looking for. So what about quoting the Risen Lord himself? “Jesus says: Do not be afraid; go and tell my brothers to go to Galilee; there they will see me.” (Ninety-five characters – pretty concise.) Unfortunately, it doesn’t tell people that Christ is risen, does it? There’s the message from the angel: “Do not be afraid. He is not here. He has been raised.” That’s fairly straight-forward, and it only takes 53 characters. It is Good News, but is it enough? Does it really convey what we want it to convey? Is it enough to convince people that this is the Good News of their lives? I don’t think so. So even though we know what the Gospel, the Good News of God in Christ Jesus, is and what it means, we still don’t have a message to Tweet that is good news for our readers. And we do want to convey good news, because this is our job. We don’t just get the Good News this morning … we have to give it as well. That’s what Jesus meant when he said, on the day he died for us, “It is finished.” He was saying that his work on this earth was done, and now he was turning it over to us. Make no mistake: This is our job. We have to spread the Good News to a world that does not know the Good News is even there! There’s a whole world out there that hasn’t quite gotten the message. For far too many people, this day isn’t about resurrection. It’s about Easter eggs and chocolate bunnies! But Jesus gave us this job, and we’d better get working. Let’s roll up our sleeves, and let’s build a Tweet together. Let’s figure out how to share with the whole world the Good News we receive on this holiest day of our lives. We can start with the words of the ancient song, the Exsultet, which can only be sung on Easter. 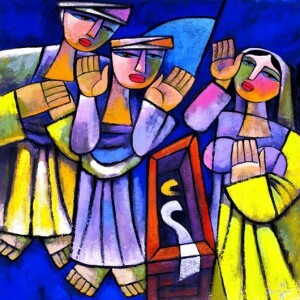 The Empty Tomb, by He Qi. For darkness has been vanquish’d by our eternal King. That’s a pretty good message, don’t you think? A little long, though … it kind of blows the 140-character limit. So let’s reduce it down. Let’s just make the first part of our Tweet say, “Rejoice!” That’s eight characters – still plenty of room to work with. But to be effective, we have to be clear why we’re rejoicing. What is it that makes us so happy on this holy day? Is it the knowledge that Jesus died for us? For each of us? Personally? Yes. But what does that mean? That God loves us, perhaps? That is why Jesus died for us, you know – because he loved us. So I think that might be the next part of the message. That’s another 14 characters, so we’re still in good shape. 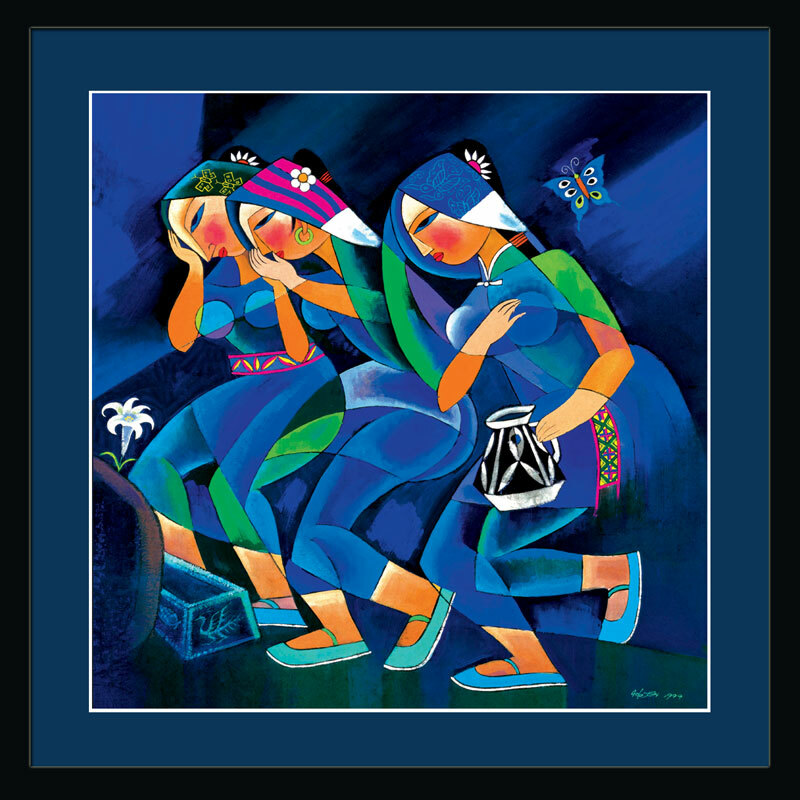 The women went to the tomb on the third day so they could anoint Jesus’ body, but he wasn’t there. He was gone. It was the angel who told them the God’s-honest truth: He has been raised from the dead – just like he told you. In that rising, my friends, God proves his love for us by not just defeating but by annihilating the one thing we fear the most: death itself. Jesus loved us so much he died for us – for each one of us, right here. God loves us so much he destroys death for us – for each one of us, right here. That takes us up to 83 characters. Meaning, we still have some room to get more of our message across. So let’s explain some more why this is all Good News. Easter Morning, by He Qi. The gloom of sin, which leads to death – emotionally, spiritually and physically – has been lifted. Our lives, which sometimes can seem so empty, so pointless, so difficult, so draining, are restored to grace and we are made holy again. Any separation from God that we may have experienced in our lives is over and done with. We have been reconciled to God. Our relationship has been put to right, we have been brought together, our accounts have been squared. We are reunited with God, and all our differences have been patched up and resolved. By dying for us, Jesus wiped the slate clean. By raising Jesus from the dead, God keeps that slate clean … forever. And that is Good News indeed. Why, it’s such Good News that I think we ought to praise the Lord for it. So let’s put an “Alleluia!” in our Tweet. We’ve got the room. And look! We still have some room left. He Is Risen, by He Qi. Put it all together, and I think we just might have our Tweet. I think we are ready to proclaim to all the world what makes us so very happy on this Easter morning. And we did it in 135 characters, thank you very much! I think my friend on Facebook would be pleased. God loves us, and we can prove it. The tomb is empty, Christ is Risen. Alleluia! 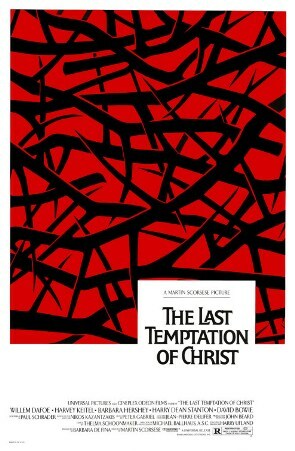 Easter sermon, preached at Trinity Episcopal Church, Arlington, Va., 24 April 2011, Year A.
I can tell you that many, many people were quite upset about this movie, because it is very challenging to them. The question of “What if …?” forces you to examine your faith, and to examine everything you know about Jesus. But regardless of how you feel about the movie as a whole, there is one scene in it that is absolutely stunning in its power, the scene of the resurrection of Lazarus. In this scene, Jesus goes to the grave of his friend Lazarus, the one whom he loved, led by Mary and Martha, followed by his disciples, surrounded by mourners. Once there, he orders the people there to remove the stone at Lazarus’ tomb. 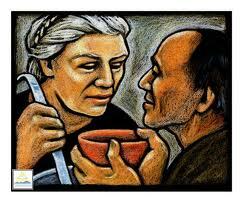 Remember, Lazarus has been dead for four days by now; Lazarus’ sister, Martha, objects, warning Jesus of the stench. (I do so love the King James Version of this Gospel: “Lord, by this time he stinketh!”) And indeed, when some of the men open the grave, the stench of Lazarus’ rotting body causes everyone present to gasp and cover their noses and mouths, and watching, you find yourself waiting for that next scene, showing people becoming ill. But nothing … happens … So Jesus crouches by that black opening of the tomb, staring into the darkness while the silence – and the tension – builds. The only noise is that of the flies, buzzing around the body in that lightless tomb. For 15 … seconds … nothing happens. … a hand shoots out of the grave! … It is never too late for Jesus to reach into the darkness of our lives, into the graves in which we find ourselves buried, to resurrect our lives and to give us new life. Even when we have been in the graves of our lives so long that decay has set in, even then, it is never too late for Jesus, because we are never beyond his reach. This recounting of Lazarus’ death and resurrection, which appears only in John’s Gospel, is a story of resurrection, of new life, of being set free – by God – from everything that buries us, from everything that binds us, everything that separates us from the love of God in Christ Jesus, everything that keeps us from living the life that God dreams of for us. Face it, we all spend time in the grave, we all live in darkness at times, we all find ourselves bound up … by fears, by anxiety, by grief and mourning, by despair and loneliness. This is the Washington Metro area, and we know what it means to live with anxiety. We’ve been stuck at Orange Terror Alert since September 2001. We know that, right? For us, it’s just the norm. But anyone who comes here to visit from someplace that is not under Code Orange wonders if there’s something going on that they should know about. How many of you pay any attention any more? And how many of you drive on (Interstate) 95, or 395 or 495, and see those signs, “Report suspicious activity”? Really? How do you define “suspicious”? I’d love to report people speeding and weaving in and out of traffic, but I don’t think that’s what Homeland Security has in mind. How many of you here ride the Metro? I know we take the Code Orange level for granted, but how would you feel if you saw someone get off one of the trains and leave behind a knapsack under a seat? Would you feel anxious? More anxious than normal? And how many of you receive a paycheck from the federal government? Or have someone in your family, or know someone, who gets one? Talk about anxiety and fear! I don’t get a paycheck a federal paycheck, and I was checking every 10 minutes on Friday night, waiting to find out if the government was going to be shut down, or if an agreement could be reached. How much anxiety and fear did you experience on Friday, wondering if you would have enough money to pay your mortgage come Tuesday, or whether you would be able to make the down-payment on the tuition so your high school senior could go to the college of her choice? Or feared you would not be able to pay your credit card bill? All because our leaders seem to have forgotten that they are supposed to be servants of the Lord, and are not Masters of the Universe? And then at the last possible second, just in time for the 11 o’clock news, our leaders announced that they would not shut down the government and we could all breathe a sigh of relief. Oh, yes, we know anxiety here and we know how it can plunge us into the depths of darkness and feel like a grave to us. We know what it means to be bound up. But I am telling you, Jesus is standing right here … right here … this very minute, with us, calling each of us by name, reaching into the graves of our lives and pull us out of that darkness, using both hands if necessary, so that we can be restored to the light. Jesus is right here, because he loves us just as he loved Lazarus. And he is crystal clear: “I am the resurrection and the life.” And all who believe in him have life … because he loves us. Because Jesus does not pull us out of the grave just so we can wander around and practice happy-clappy Christianity. Because Christianity is not supposed to be happy-clappy. And for darned sure that isn’t what it means to be an Episcopalian. Resurrection is serious business. Jesus is the Resurrection and the Life, and he is in our lives, giving us the same gift he gave to Lazarus: new life so that we can go forth into the world to love and serve the Lord! This new life that Jesus gives us is a life of service. It’s a call to us to delight in God’s will, to walk in God’s ways to the glory of God’s name! Being set free is not about us – it’s about God and God’s dream for us. … to proclaim the year of the Lord’s favor not once every 50 years, but every year! Jesus is standing at our graves, my friends. He has said the prayers over us. And he is calling us – each of us – by name. He is taking us out of that darkness that binds us, and setting each one of us free. A sermon preached on the Fifth Sunday of Lent, Year A, 10 April 2011, at St. George’s Episcopal Church, Arlington, Va.
Tuesday in Holy Week in Haiti began with taking more Duduza Comfort Dolls to the children at the Little School at College St. Pierre in Port au Prince. Today was the last day of the school; the Tent City is being taken down, and the Internally Displaced Persons are being sent out into the countryside – or so the Haitian government hopes. All of the Tent Cities are hard places in which to live; there is little sanitation, not enough room, not enough water, and with the rains here, the situation is only getting worse. Where all the people will go, and whether the new camps will be ready for them, is a question none of us can answer. What a hard way to live: To know that at any moment, another disaster could strike, and these little ones could be left alone, with no one knowing who they are, or to whom they belong. It is not simply fear of another earthquake or aftershock that drives this fear; we had a 4.2 aftershock early on Sunday morning. It’s knowing that with so many buildings still crumpled but not completely fallen, with so many canted to one side or the other, with balconies overhanging streets without any support, that it not take much to create another disaster. And never mind the disease that already is being seen in Haiti; more rain brings more illness, and despite all the aid flowing into the country, there is still not enough medicine, or medical care, and an almost total lack of decent housing. Yet despite this fear that hangs over everything, the Haitians continue to show incredible strength. They work together, they help each other, they hold revivals, they pray, they sing songs of praise to God daily. For the past couple of nights, there has been a revival concert going on at the Tent City across from my church in Petion Ville. The shouts of “Allelulia!” ring late into the evening. Haitians are suffering, but they haven’t forsaken their faith in God. Or, as I keep telling them, they have confidence in God because they know that God has confidence in them. I also went over to College St. Pierre itself, to see what no longer was. Most of the grounds have been cleared; construction already has begun on a new school. It is a shock every time to see empty land where once a beloved landmark stood, almost as shocking as seeing the destruction. But the Haitians never stop. Yes, there was an earthquake. Yes, it was and remains horrible. But to paraphrase the Bishop and all the Haitians I know, no earthquake is going to stop the Haitians. This afternoon, the clergy of the Diocese gathered at the open-air Cathedral on the grounds of the Holy Trinity complex. To renew my ordination vows here in Haiti at this time was indeed holy. Behind the open-air Cathedral stand the remains of the magnificent, world-renown cathedral. And all around us are empty grounds now. Holy Trinity Primary School, Holy Trinity Music School, Holy Trinity Trade School … all are gone, razed to the ground. It’s very disconcerting to drive down the street and be unable to find any landmarks. Thankfully, Pere David Cesar was driving and knew where to go; I would have driven right on by. Bishop Duracin preached about the need for us to re-examine our vows and live into them more deeply, more fully, to exercise patience and pastoral care, to be strong so that we can lead the Church and the nation in this time of renewal. What he said today is what he has been saying from the beginning: We have our people; we have our faith. This IS our new creation, and we must make the most of it. At the end of the service, Bishop Duracin anointed each one of us – 250 or more – with holy oil, pressing the cross of Christ onto our foreheads to further strengthen us as we go right back out into the world to do the work God has given us to do. Looking around, seeing all the clergy, along with 200 laity who came to worship as well, is to see the strength of the people of Haiti. Life is difficult here. But no one is giving up. We are clearing rubble, burying our dead, praising God and moving on with life. Haiti will be resurrected. And in this holiest of weeks, that is the message I and so many others especially need to hear.